Info "What's inside the container? Turn it upside down and shake it!" Shake Down is one of Dr. Crygor's microgames in WarioWare: Twisted! 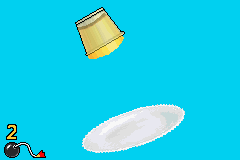 The game's purpose is to turn the container upside down, then shake it to make its items fall. If done so, the game is won. 1st level difficulty: The container is a glass with gelatin in it. 2nd level difficulty: The container is a vase with an octopus in it. 3rd level difficulty: The container is a trash can with some trash, a cat and a word that says "Dreams", "Love" or "Hope" in it. This page was last edited on December 8, 2018, at 18:39.